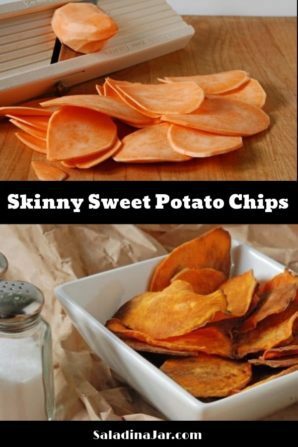 Skinny Sweet Potato Chips • Make them yourself for a can't-stop-eating treat. My daughter-in-law has given us the nickname, “the condiment family.” And now that I think about it, she may be right. We love to dip. Not the nasty kind of dip that rots out your lower lip. We’re talking about various condiments like mustards, ketchup, ranch dressing, sweet and sour sauce, salsa, etc. But we’re stumped. Can you help? My friend, Joan, recently put us on to frozen sweet potato fries sold at Costco. They are scrumptious. However, we can’t figure out what condiment goes with them. We’ve tried several things, but so far, we don’t have a winner. Please leave your suggestion in the comments. UPDATE: Since I originally published this post, I have discovered a good dip. Click here to read about it. Now about those frozen sweet potato fries, they are good and easy. But if you would rather have half the calories for just a little more effort, these chips are delicious. They do require attention in the oven, however, as some will cook more quickly than others due to slight irregularities in thickness. Perfection is overrated! You need to mandolin to slice potatoes this thinly. See how thin those slices are? You need a mandolin to do this easily. The one pictured is older and still available, but I have and love the one linked to previously and recommend it. If you don’t get the potatoes sliced thin enough, they won’t get crispy. Of course, you can try with a sharp knife. 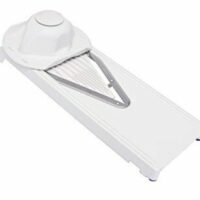 A food processor with a thin slicing attachment would also work. Preheat oven to 400 degrees. Spray a baking sheet with nonstick cooking spray or use a silicone baking sheet (my choice) or parchment paper. 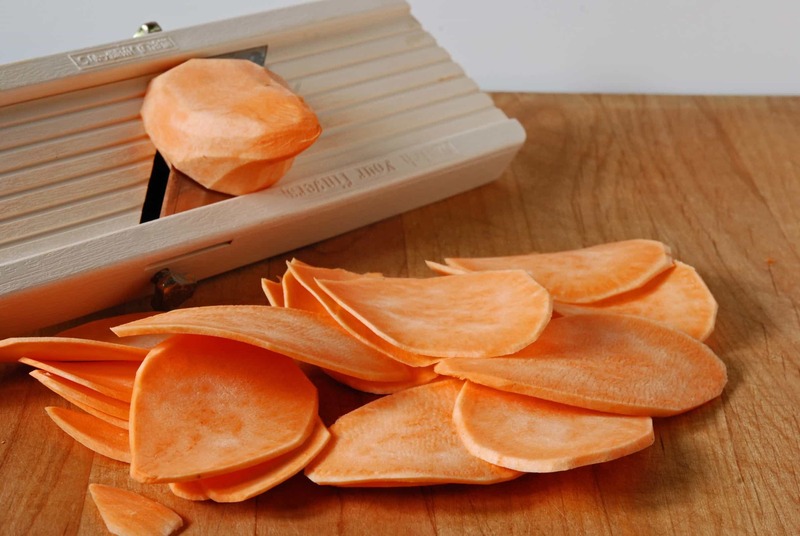 Slice the sweet potatoes into very thin slices. In a large bowl, toss potato slices with oil and salt to coat lightly. Lay the slices in a single layer on the prepared baking sheet. Bake for 15 minutes. Turn over each chip and bake for 5 minutes more or until chips are crisp. Watch carefully at the end so they don't burn. CURRY KETCHUP! I’m telling you. This with sweet potato is the bomb diggity. 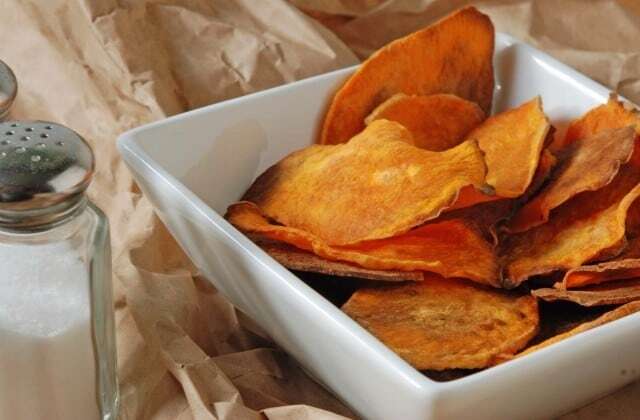 Hi Paula, I love sweet potato chips and most of the time I have them with a garlic aoli ..! It’s so nice! Here in Nova Scotia, curry mayonnaise is served with sweet potato fries. I’m trying these chips tonight! Thanks! I’m assuming you just add a little bit of curry to some mayonnaise. Sounds really good. Must try. Thanks for sharing. Yes, add curry to your taste. I use fat free mayo myself. I absolutly love this dip for sweet potato fries. Then mix in juice of one half a lime. This quick to make, spicy, creamy refreshing dip is perfect with sweet potatoes! Love the sound of your dip recipe. Can’t wait to try it out. I like BBQ sauce with my sweet potatoes. We recently went to a restaurant that served sweet potato fries, they had “marshmallow fluff” as the fries dipping sauce, I did NOT like it. BBQ sauce? I know my husband would go for that. I agree with you on the marshmallow fluff. Sprinkle chips “gently” with cayenne pepper after the oil and before cooking…believe munchers will like the smoky heat n sweet crunch regardless of the dip served. This sounds fantastic! Must try soon. An even easier way – and with fewer calories — Bed, Bath and Beyond sells a silicone rack and mandolin for around twenty dollars (less with coupon!) and all you have to do is put it in the microwave for a few minutes. No oil necessary, and no burning. Works with other potatoes and some fruit (apples, pears). 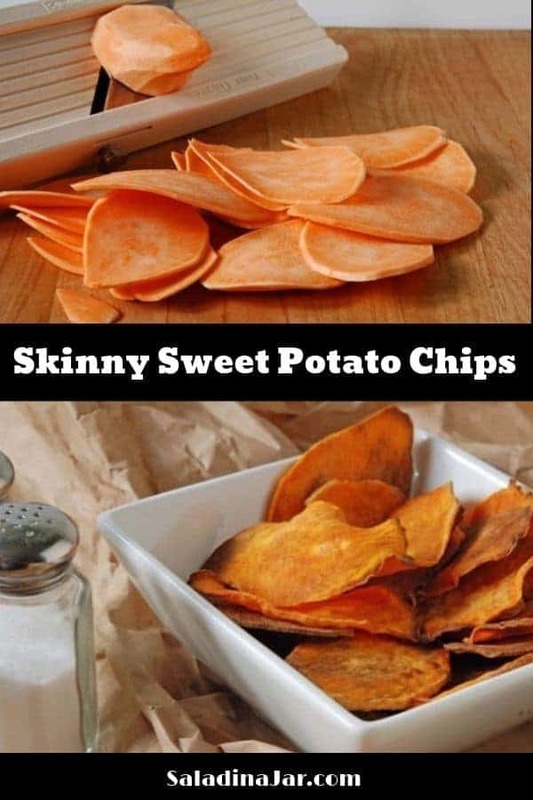 Hungry Girl has a great sweet potato fries recipe that is low in calories and high in flavor. One or two good size sweet potatoes makes a lot! Plus it’s super simple since she doesn’t do a lot of steps. I’ve also found that if you’re fairly careful you can even lower the use of oil/spray to reduce calories further. My favorite dip for sweet potato fries is Greek yogurt or light sour cream mixed with a little lime juice and chili powder. Perfect complement for the flavors. wasabi ketchup! a favorite bar of mine serves sweet potato fries with wasabi ketchup and they are awesome! Just mix a little premade wasabi paste (found in asian grocery stores) with some ketchup until you get your preferred level of zing! I suppose you could sub regular prepared jarred horseradish, if you can’t find wasabi paste. I happen to like horseradish with my sweet potaote chips. I sprinkle a little cinnamon on them after I remove them from the stove. I also like a sweet hot mustard with them. Also, minced FRESH garlic and a little sea salt in some greek yogurt would be a nice try! Try making a dip with greek yogurt to which you add a tad bit of honey, agave, sorghum or powdered stevia, and a little cinnamon!!! Out of this world good! A dipping sauce of greek yogurt + sweet chili sauce is the best on these! Recently I was in my hometown and of course was off to Costco to do a bit of shopping. They were sampling sweet potato fries with a new dressing called Roasted Garlic and Chili Aioli….I am hooked…it is scrumptious…I bought 3 bottles and now eat it on spuds , fish..in sandwiches….Its great. I agree with Rebecca! Honey mustard is my go-to dipping sauce for anything sweet potato. I like to sprinkle them with cayenne or chili powder before baking as well. Try apple butter as a dip. A local restaurant serves their sweet potato fries with apple butter…and its just so good!! For a sweet tooth day – what about apple sauce mixed with cinnamon, or some smooth apple butter? Thanks Kate for taking the time to type out the recipe. Can’t wait to give it a try. Bet it’s good on other things too. I grew up with sweet potatoes in any form you can think of. Honey mustard goes great with sweet potatoes fries. Salsa and guacamole go better with sweet potato chips. Lastly, brown sugar and butter sauce (sage and cinnamon optional) goes well with the fries. Enjoy! I’m going to try the honey mustard first and then the butter sauce. Awesome ideas–thanks for sharing. that does sound good. paula, maybe you could come up with some type of “sweet potato fries” dip, and sell it! even though the ingredients sound easy to you, someone like me would spend money on it because i wouldn’t want to go to the trouble of mixing stuff together. it could even be a dip under the product line named “the condiment family.” wouldn’t that be cute? I find that chipotle flavored things go really well with the sweet potato fries at Costco. Sometimes I just season the fries with some powered chipotle directly. But the other way you could do it, to meet the condiment requirement :-), would be to make a spicy chipotle mayo kind of dip. Mayo is the only thing that I can think of that would not be too over-powering for the sweet potatoes. The spicy stuff works well I think because it compliments the sweetness without fighting with it. Hope that helps! And thanks for the link to my blog about Costco! Kimberly, Great idea. I love mayonnaise with regular french fries. So I think the chipotle would be just the right touch. I will try it. So excited to find your blog because I luv Costco!